We’re right in that cozy spot around Thanksgiving where the weather is making us want to curl up in a luxurious blanket watching movies. We’re hopeful everyone has taken down their Halloween decorations by now… but we’re just not quite ready to set up for Christmas yet. So how do you upgrade your space for the cold before you jump right in to red, green, and white for the holidays. Layers! Textures! Jewel-tones! It’s so refreshing to upgrade your home for each upcoming season. Whether that means you have some pillows you switch out for the holidays, or just some decorative objects reminiscent of the beach during the summer. It’s a really simple way to add personality to your home, and this time of year is our favorite to do so. Families come to town and everyone gathers together for quality time and good food. 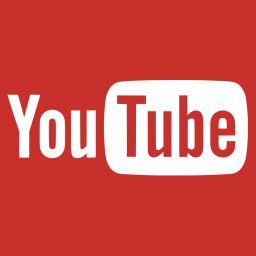 We’re going to show you some of the easiest ways to do this without completely transforming your space. With colder weather, you want to create layers! We went for a similar style for all of our combinations that you see below. Lots of bold textures and neutrals that are still bright and playful. 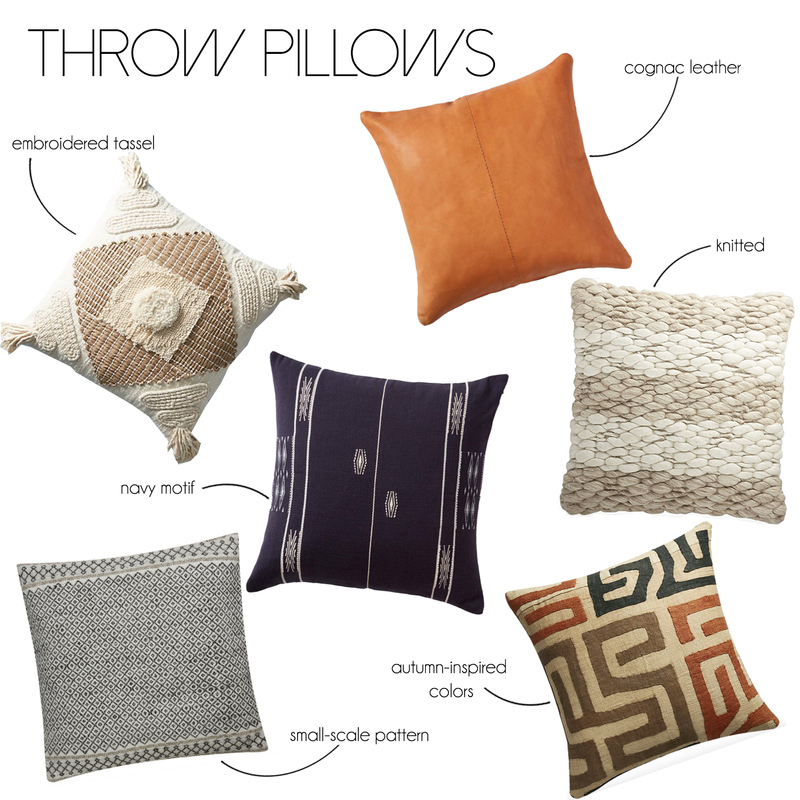 Create depth in the living room with leather, knitted, and embroidered pillows. Add warmth and coziness to the space with these options! 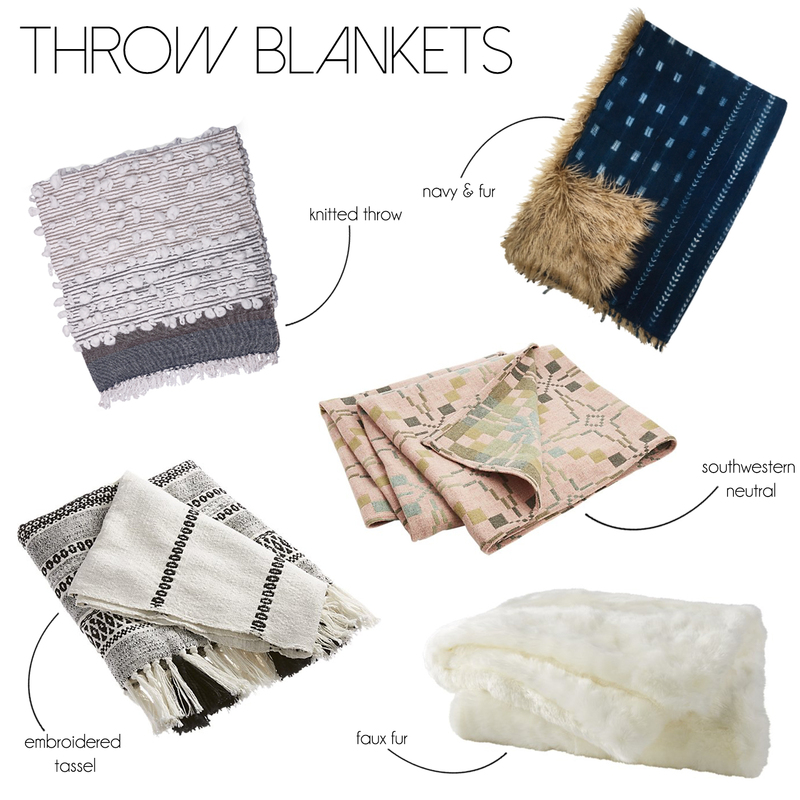 We had to include throw blankets also… They are so versatile! Throw it on the back of a sofa, lay along the seat of an armchair, leave it draped out of a woven basket, or hang it over the edge of your bed. We love the range of textures here again. If you’re feeling adventurous, you can even layer the blankets! That soft, southwestern print is thin enough to lay on the edge of a bed and top it off with white, faux fur for extra layers we love this season. 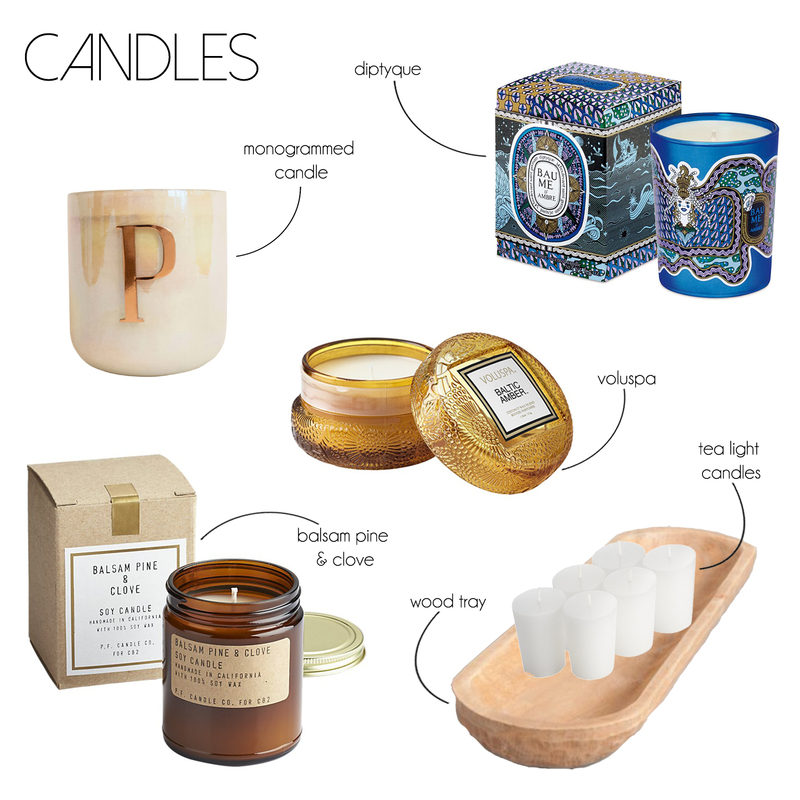 Candles are must year-round. But we especially love them in this weather for the coziness it brings in these early evenings. Be on the lookout for pretty candle vases and holders that have strong colors that can easily blend in with neutrals. Tea light candles are relatively cheap but when you use the right placement, they can look really chic. (Even though we think they’re pretty chic on their own.) This fall, instead of going for the brass accents we’ve seen so much of in the last two years, find something slightly rustic with a contemporary edge to bring out the earthiness of the cold weather. 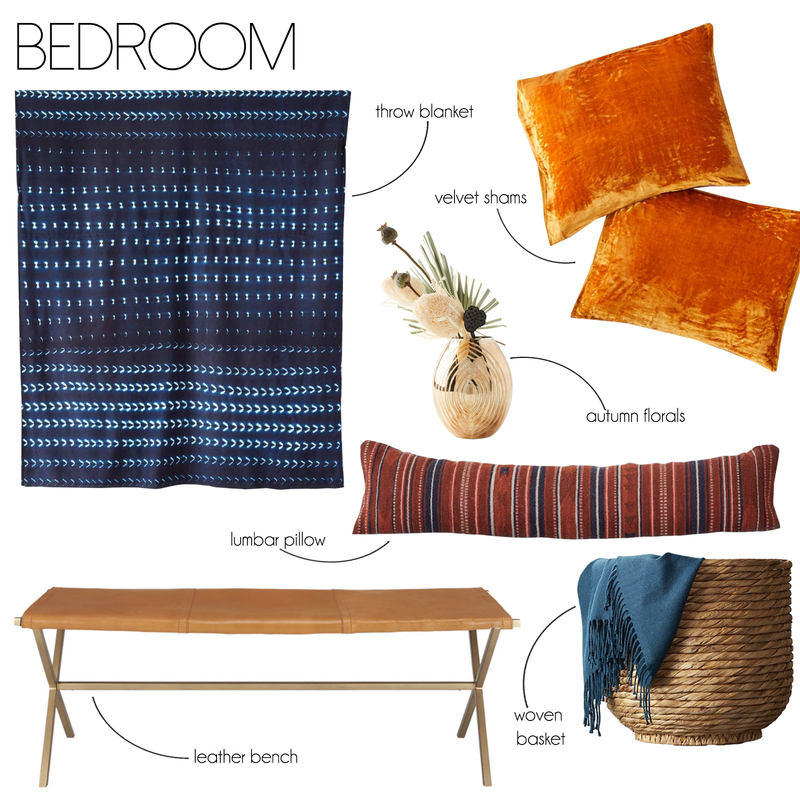 And of course, we gathered an array of items that can easily upgrade your bedroom into something a little more cozy. A throw blanket is an absolute must for warmth and texture. We love the shiny, crushed velvet shams for that extra color that is bright enough yet still perfect for the season. The lumbar pillow is also a fave. It’s a simple way to add that depth you want for perfectly made bed- without going overboard on layered pillows. Again, we’re going for natural materials like in the woven basket, cognac leather in the bench, and a color scheme that is rich yet calm.